At the heart of the temperance movement was a document called a pledge that people signed to stop drinking alcohol. In some cases, particularly in the early nineteenth century, people pledged to stop drinking hard or distilled spirits, such as whiskey and gin, only. In the very early days of the temperance movement a distinction was made between the different types of alcohol with wine and beer viewed as healthy and beneficial while whiskey and gin were considered toxic to both body and soul. Later, it became more popular to give up alcohol totally or to become a "teetotaler." Usually the pledge was signed in a public meeting and witnessed by all the people present. This was an important component of the temperance movement. Making a public declaration reinforced its importance and made it more difficult to reverse. Those who witnessed your actions were often available later to give you strength in keeping your word. Temperance pledges came in all sizes and shapes. They could be as simple as a blank notebook or a ledger with a handwritten or printed pledge at the top of each page. Such ledgers would hold hundreds of signatures. 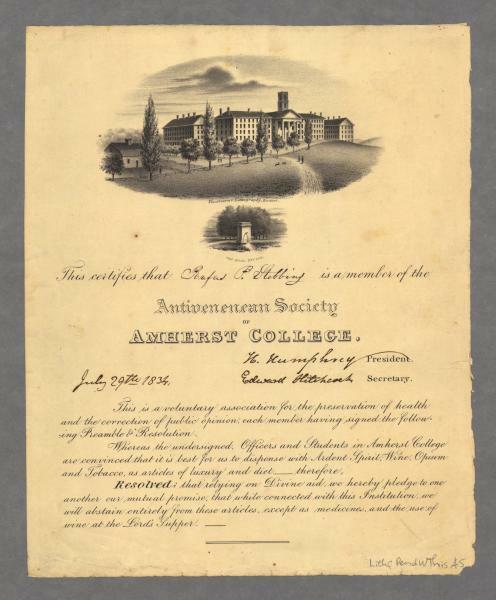 In other cases the pledge was an elaborately printed document like this one from Amherst College. A pledge such as this might well have been framed and displayed as a further testament to the individual's belief in the temperance cause and as a physical manifestation of the signer's honesty and integrity. This is a voluntary association for the preservation of health and the correction of public opinion, each member having signed the following Preamble & Resolution. Exact Title: This certifies that [Rufus P. Stebbins] is a member of the Antivenenean Society of Amherst College. [graphic]. Dimensions: image and text 26 x 21 cm., sheet 30 x 24 cm.